Thousands of financial pilgrims have credited the weeping statue with increased quarterly earnings and miraculously doubled bonuses. 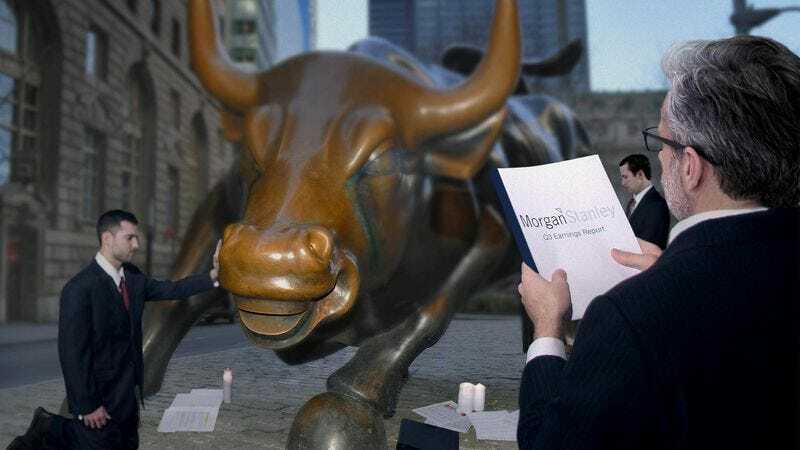 NEW YORK—Hailing the phenomenon as a genuine economic miracle, droves of investors and financial professionals continued flocking to the Charging Bull statue in Lower Manhattan this week to see the tears reportedly flowing from its eyes. Shortly after the closing bell on October 14, when the S&P 500 fell below 2,000, witnesses reported seeing droplets of moisture trailing from the eyes of the Wall Street icon, an event many among the faithful believe is no mere coincidence. Ever since, a steady stream of awestruck traders and financial executives have been observed making the trek down Broadway to Bowling Green Park, where they can touch the 7,000-pound sculpture’s horns and beseech it to grant them a profitable IPO, merger, or tax inversion. According to estimates, tens of thousands of financial pilgrims have journeyed to witness the bull’s tears over the past several weeks, with some arriving from as far away as the Nikkei exchange in Tokyo. Devout commodity traders, securities brokers, and portfolio managers have been seen fighting their way through the crowds to prostrate themselves at the sculpture’s hooves. Often, they will seek blessings from the lachrymose statue, sources said, by leaving behind offerings such as incense, personal net worth statements, or proprietary trading algorithms. Many of the financial professionals who have supplicated themselves before the sculpture told reporters they believe its weeping foretells an era of doom in which tougher bank regulations will require institutions to maintain higher capital reserve ratios. Others, however, claimed the bull’s tears were a portent of prosperity and good fortune, heralding a protracted period of high returns, ample arbitrage opportunities, or even the imminent overturning of the Dodd-Frank Wall Street Reform and Consumer Protection Act of 2010. Sources said several of the most committed devotees have elected to remain by the statue day and night, fasting and flogging themselves with SEC quarterly reports in order to purify themselves for the coming fiscal year. JPMorgan Chase CEO Jamie Dimon is reportedly among those who have refused to leave the bull’s side since witnessing the phenomenon, with the Fortune 500 CEO growing gaunt and pale as he sits beside the statue softly reciting the latest LIBOR rates while subsisting on a single simple daily meal of sparkling water and salmon crudo. “I can’t wait to spread the good news of double-digit annualized yields to all the true-believing partners in my firm,” Stremski added. At press time, the Institute of International Finance had certified the event as an official financial miracle, the first such designation issued since 2008, when the financial services firm AIG extraordinarily arose from the dead.